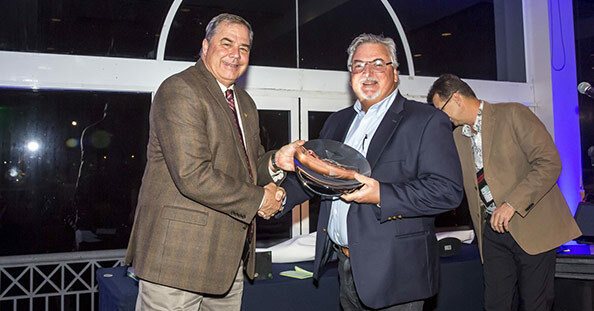 Jim Hirsch of Air Tractor USA (left) presenting the Leland Snow Innovation Award to Gordon Hedges of Balmoral Engineering. Phil Hurst, CEO of the AAAA, thanked Balmoral Engineering for their contribution to aviation safety in developing the Rotamarka. “There is no doubt in our mind that the Balmoral marker will save lives due to its high visibility, its relatively low cost and its ease of fitment. 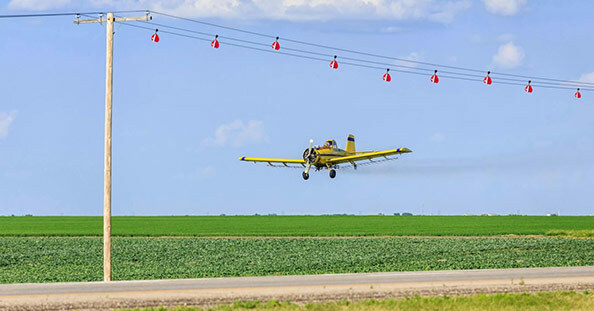 While aircraft wire-strikes are only a fraction of the total safety problem surrounding contact between all vehicles and farm implements with power infrastructure, it is a significant cost to our industry and a personal impact on pilots involved in wire-strikes. Training and ongoing professional development play a significant role in preparing pilots to manage the risks associated with low level operations around power lines, but power line marking will definitely improve safety for the sector. Congratulations again to Balmoral Engineering on winning such a prestigious industry award. We look forward to working with Balmoral and our customers to improve aerial safety across the country. Take a look at the bayonet Rotamarka here and the eye-ring Rotamarka here.